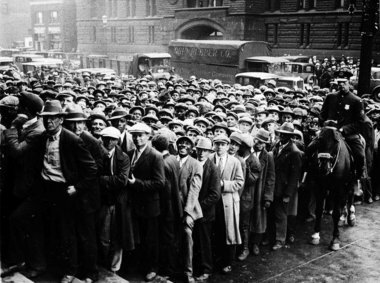 The great depression was a worldwide economic depression preceding World War II. For most countries, it started in 1930, and lasted until late 1930s, or mid 1940s. It was the longest, most depriving, and most widespread depression in the 20th century. It officially became worldwide news when the stock market crashed on October 29th, 1929, later known as Black Tuesday. Te effects were instantaneous and drastic. Cities that relied on heavy industries were hit hard, and construction was virtually halted in many countries. Personal income, tax revenue, profits and prices dropped, while international trade dropped by more than 50%. Unemployment in the U.S. rose to 25%, and in some countries, as high as 33%. Some countries were able to recover by the mid 1930s, but others weren’t as lucky, the depression lasting until after WWII. Though the exact cause is undetermined, many factors set the depression up; bank errors and failure, the stock market crash, etc. Many people believed it was President Herbert Hoover’s fault, on the grounds that he was in power when it happened, and he didn’t do everything he could to end it. When Franklin Delano Roosevelt was elected as president in 1932, he said in his election speech; “”I pledge you, I pledge myself to a new deal for the American people… This is more than a political campaign. It is a call to arms.” As soon as he was elected, FDR did everything he could to fulfill his pledge, and bring recovery to America. He started the C.C.Camps; groups of workers who set out to build the highway system across America, and different buildings. As well as that, one of the things that helped break the depression was the re-legalization of alcohol by the repeal of the Prohibition Act. This among other things helped hugely, and the depression finally broke with the start of WWII.